Joining hands to meet the needs of the Ati people. There are a lot of things I love about the ocean - the beautiful life that is hidden beneath the surface, the subtle, yet powerful shifting tide of the waves - but one of the things I love most is from beneath the water, the way the sunlight scatters throughout the entire ocean, illuminating the secrets hidden below with its dancing rays of light. Whether it’s the clownfish protecting its anemone, a pair of butterfly fish flitting about tide, or the coral that houses them all, it is this scattered light that gives the reefs their striking beauty. This beauty was extremely evident in the reefs of Cauayan, an island near El Nido, Palawan, in the Philippines, where my family spent the last two weeks. Not just my immediate family either, but 46 of us from my mom’s side (and that’s not even all of us!). My mother’s side of the family is from the Philippines, yet for many of us it was our first time to visit this place of our heritage. And it was in this place that I saw the light scattering across the ocean, which touches every part of the Philippines and its 7,000+ islands. Seeing the way it scattered reminded me of what I’ve been learning about the physics of light (S/O to preparing for the MCAT): that when a ray of light travels from one medium to another it is refracted. This means that it changes direction. And when it enters water, it goes in all directions beyond what we can see, much like the life of my grandfather. My Lolo (grandfather in Tagalog, the native Filipino language) served in WWII as a Philippine scout. After escaping the Bataan Death March and hiding for two years in the country as his brother nursed him back to health from malaria, he reported back to war with the Americans, which also granted him US citizenship. This changed everything for not only him, but the generations that would follow. He met my grandma, Lola, and they came to America. My mom and her sister were two of the few of their cousins born in the US, so as those cousins began moving here, Lola would take care of them for several months before their parents followed. Eventually, most of Lola’s eight siblings and all of their kids were able to come and have a life in America. Because of Lolo’s decision - to fight, to escape, to survive, only to return again to battle to defend his country - was my family able to come to the US. And now that we are in the third and fourth generations that followed, his decision paved the way for all of us. This was a sobering thought as I sat in the village of the Ati people, a tribe on the island of Boracay that is discriminated against because of their dark skin. This has led to their low socioeconomic status in an already poor country due to their inability to get jobs or education. But one of my mom’s cousins, Grace, saw them as more. So, her and her husband, Marvin, began helping the village and the school there that fights to give the kids a foundational education. Since 2009, they have gone to provide relief and care. But this year, we wanted to make it a family project. This seemed like quite a task, considering there are so many of us spread out across the country. But it was something we wanted, not because we are second cousins (or whatever other category of family, none of us even really know), but because we are family. So, the fact that almost all of us were there to help together – with our hands, our smiles, and our hearts – really opened our eyes. For me, it was a powerful reminder that our actions today impact so many lives in ways we might not ever know. As I helped adults try on glasses and see clearly for the first time at the ages of 50 and older, I saw clearly how, were it not for Lolo’s grit and determination, I might not have the life I have today (or any at all for that matter). My mom would’ve been born in the Philippines and never met my dad in Seattle. I could’ve been living in the Philippines with practically nothing, which begged the question - would I still have the same joy of the Ati kids? The gratefulness of their parents for the help from some American stranger? 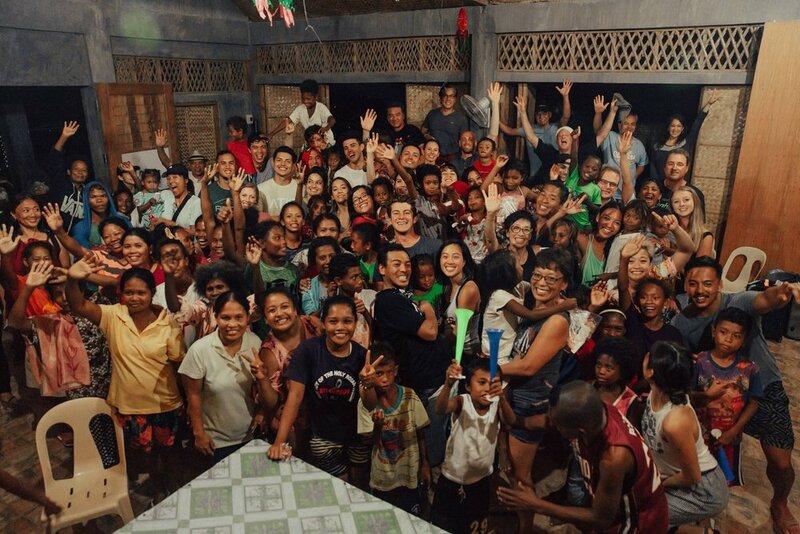 These people were getting basic vitamins, balloon toys, medical and dental check-ups, hearing the Gospel and receiving reading glasses - all for possibly the first time. Yet I take each of those things for granted every day. And so, I leave the Philippines with a grateful heart - for the Ati people, for the work Grace and Marvin are doing for them, for an opportunity for our family to serve together, and for my grandfather that made it all possible in the first place. His life and his legacy will continue to serve as a reminder and a challenge - to live a life of refraction, a life in which my actions and my words go out like those rays of light in the ocean, touching the lives of those not only around me, but also the faces I will never know, in such a way that it might change their direction: towards a more hopeful, a more joyful, a more fulfilling life.